Get started on your daily fruits and vegetables with a trendy breakfast salad - filling, but not in that oatmeal kind of way! This salad is a fun contrast of crunchy kale, sweet-sour grapefruit, creamy avocado and chewy farro that will wake up your tastebuds and fuel you for a busy day. Even though I’ve called this a breakfast salad, it’s equally delicious for lunch or dinner, and would pair really well with a thin, seared piece of steak. Cut the top and bottom off of the grapefruit. Using a sharp knife, remove the peel and white pith from the pulp. Starting at the top, cut between the white and the pulp of the fruit, and work your way down and around, trying to leave as much of the pulp intact as possible. Save any bits of peel that have pulp attached. Holding the peeled fruit over a medium bowl to catch the juice, carefully cut the segments free from the membranes and remove any seeds. Set the segments aside. Squeeze the remaining membrane and peels for as much juice as possible, you should have about 2 tablespoons. Whisk the olive oil, salt and pepper in with the grapefruit juice to create your dressing. Wash and destem your kale, and tear it into large bite-size pieces. In a large bowl combine the farro and kale. Drizzle the dressing over and massage it into the kale. Divide the salad between two bowls (or plates, if that’s how you roll). Cut the avocado in half, remove the pit and score in a grid to create cubes. Scoop one half of the avocado into each bowl. 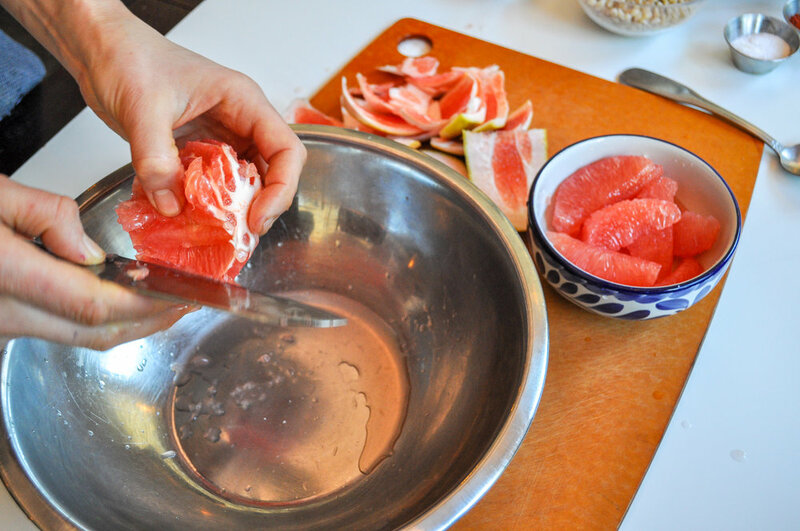 Roughly tear the grapefruit segments into chunks and divide between the two bowls. Garnish with flaky salt, chili flakes, and a twist of fresh ground black pepper. Breakfast salads are a great way to use up any leftover grains from dinner. If using rice, revive it by steaming it for 30 seconds in the microwave or in a pan on the stove. And as always - put an egg on it! This salad would be great topped with a medium-boiled egg.